Real easy, the etiquette experts tell us. 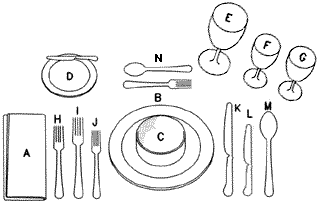 The general rule with utensils is to start from the outside of your place setting, and work your way toward the service plate (the main meal plate): soup spoon first, then fish knife and fork, then service knife and fork. Despite what mother told you, culinary experts say you do not always have to wait for everyone to begin – start eating hot food when it is served. For cold foods or buffets, wait for the host to announce dinner, and wait until the head guest starts dishing. Now that you have the correct table setting and the proper wine glasses, see which wines go best with what food, and then make sure you get the right person to share it with!